Prime Sristi is constructing a twin tower project â€˜Trust Heightsâ€™ in Mugalivakkam, which collapsed due to heavy rains on 28th June 2014, Saturday. Karyakarthas reached the accident spot within an hour. Understanding the seriousness of situation, swayamsevaks from different areas were called for rescue operation. Soon after, CMRL- L&T, AFCONS workers and engineers arrived at the place with rescue equipment, the karyakarthas started the rescue work at 8:00 pm. NDRF reached at the accident site at 9:30 pm. Karyakarthas headed by Sri Sudharshan, Jilla Sampark pramuk along with Sri Vishnu Shankar Porur Nagar karyavah were split into four groups; the first group cleared the path for rescue vehicles like crane proclainer etc, the second group concentrated on immediate rescue of live victims who were trapped under the collapsed building. The third group provided hospitality for the rescuers and prevented public from the reaching the accident site. The fourth group co-ordinated the entire work and recorded the happenings of the rescue operation.Â A group of swayamsevaks from Kottivakkam supplied food and snacks to the rescuers. Ladies supplied water to them. Rescuers, CMRL Engineers, Fire and rescue forces and karyakarthas worked together and started the rescue operations. They started the rescue operations at four different points in the accident area. Three victims were identified by our karyakarthas by their vocal echoes. While rescuing them around 10 dead bodies were found at unreachable places. Three live victims were rescued with the help of CMRL Engineers, fire and rescue officers. Due to lack of co-ordination from NDRF and other government forces, the rescue operations were delayed. However, swayamsevaks, CMRL Workers and Fire & rescue officers continued their rescue operations till 5:50 am. NDRF resumed their operation at 5:00 am. The police higher officials arrived at 5:50 am and ordered karyakarthas to stop their rescue operation and further added that they will continue the rescue work on their own. Immediately, karyakarthas handed over the work and left the place. Hearing this, CMRL withdrew their equipment and refused to work without karyakarthas.Â Later, on persuasion, they resumed to work. 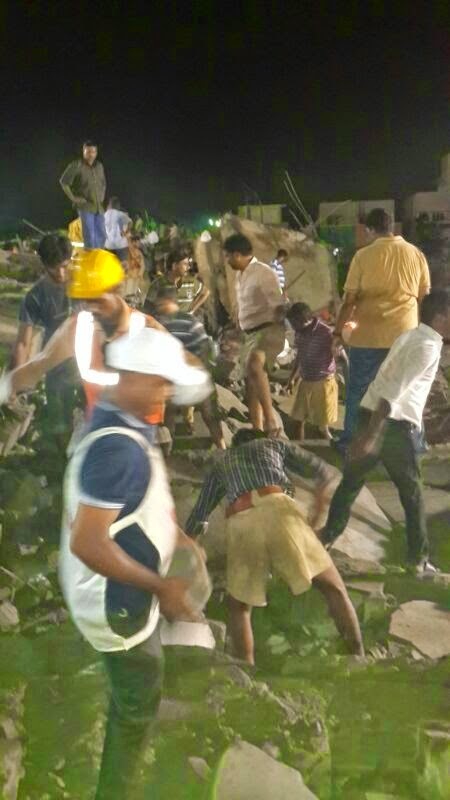 Karyakarthas appealed the collector of Kancheepuram, who inspected the accident site to recover the entry register from the office to know the approximate number of victims trapped in the collapsed building and to accelerate the rescue operations. Karyakarthas further, submitted their information/report to the Nellore and Srikakulam collector on the work done by them during rescue operation.Â Local police Assistant Commissioner praised the work of swayamsevaks.Â Local public also participated in the relief operation. Altogether 12 live victims were rescued and around 22 dead bodies were recovered. Around ten dead bodies were found in different places where immediate recovery was not possible. Karyakarthas have identified a site where 14 members at ground floor based on the information given by the victimsâ€™ relations and reported the same to rescue Co-ordinator. According to a local residentâ€™s statement there were around 150 workers inside the building before the disaster. A relative of victim claims that there are 6 of his family members trapped inside the collapsed building. Similarly, another worker appealed that his wife and son are stuck under the debris. However there is no clarity of the number of people trapped. The Death toll may rise to a higher number when the rescue operation reaches the ground floor.